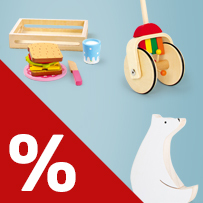 100 new special toy offers and discounted decoration products online – discounts of up to 30%! We need space, and you’re going to profit from it! Starting now, you’ll once again find many new special offers at great discounted prices in the Sale % category of our online shop. Come take a quick look and get your share of discounts of up to 30% – the sales are only going on while supplies last! Come discover low-priced favourites on sale from all product categories as well as great deals on toys, special items and discounted decoration products! These two, white painted wooden polar bears can be used to create a charming winter decoration. With their simple design these polar bears are an unusual decoration. One is in a standing position and the other is seated. A great gift and a perfect decoration for any room. The crib motif as well as the motifs on the edge are made of plywood and are carefully cut out! Batteries not included. American Diner! Hamburger, sandwiches and milkshakes are served on these great wooden trays. Two colourful small wooden plates are also included. The two wooden knives help to train slicing the individual delicacies which are connected with Velcro fasteners. Enjoy a delicious meal together with friends! Metal pots, pan and sieve adorned with a beautiful décor! 2 wooden spoons and a spatula round off this terrific and absolutely necessary equipment for every children’s cuisine. Including table cloth, napkin and pot holder in red-white chequers. Displayed in a handy cardboard suitcase with snap lock, transparent lid and carrying handle! Different kinds of bread with various fillings. The fillings (egg, tomato, salad, sausage) are placed on the slices of bread with magnets. A brilliant addition to the other items from the children‘s kitchen range! A melodious companion for the first steps! While the wheels turn, little wooden sticks strike the xylophone plates and create a cheerful sound. Rubber bands on the wheels ensure a smooth running on the floor. The pushing rod can be easily removed for a space-saving storage. Charming: the owl mother trains winding with her sweet little fledgling. This pull-along toy offers various play options whether pulled or pushed, play alone or together with a friend. With this colourful toy the shape recognition and different types of movement are trained.